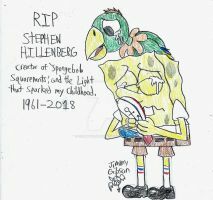 Rest in Peace Stephen Hillenburg. You're about to join the rest of the greats very soon. A lot of creators have recently passed this year, but we often forget about the ones who were already for quite some time. All of these creators may be gone but we will never forget the impact they have made on our lives. From a Pineapple under the sea to that empty bottle of Cola to an entire Magic Kingdom for us to explore. Bruh, Edd Gould was only 23! TF! Eddsworld Matt is Mickey Mouse. I officially welcome SpongeBob into TWOTC: Toons Who've Outlived Their Creators. is it ok if I color this and posts this on my page. ill give credit to you. ill provide a link to this and also its on my favorites so people know im not stealing your art. ill give you all the credit. I could at least have a little because I colored it to make it brighter. As long as you give credit. Then sure, color away! Can I do the same with a little background color change (as of the pics on my profile) I'll give you credit for it. I know, made me tear up to.